The organic essential oils of ginger, eucalyptus, black pepper, clove bud and spearmint we’ve included in this power blend all deliver a rubefacient action that causes blood vessels to dilate, which increases blood circulation and produces a deep, penetrating warmth. The increased blood circulation brings more oxygen to your muscles, and in turn this accelerates the speed of nerve impulses making your performance better and faster. 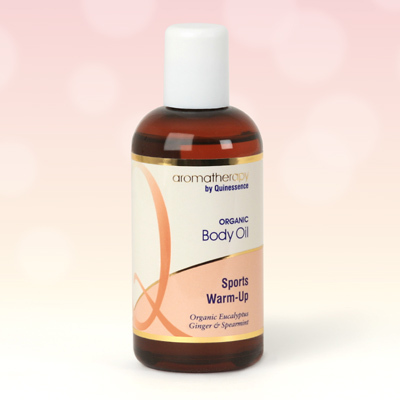 An added bonus of using this Sports Warm-Up Body Oil is that since your muscles are warmed and looser, it reduces the risk of tearing ligaments and muscles during training. This is why top athletes around the world always use a pre-sports massage to enhance their warm-up exercises, and then after training finish with a cool-down massage blend. Contains Certified Organic Essential oils of: Ginger, Eucalyptus Radiata, Black Pepper, Spearmint, and Clove Bud in blended Sunflower, Coconut and Black Seed carrier oil. Helianthus annuus, Cocos nucifera, Nigella sativa, Zingiber officnale, Eucalyptus radiata, Piper nigrum, Mentha spicata, Syzygium aromaticum.